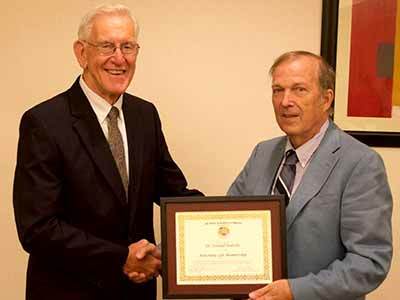 Don Halseth, emeritus associate professor in the Horticulture Section, was awarded an Honorary Life Membership in the Potato Association of America at the PAA annual meeting July 22 in Portland, Maine. Honorary Life Membership is the highest award bestowed upon an individual by the PAA, and recognizes outstanding contributions to the potato industry and to the organization. Emeritus Horticulture faculty Joe Sieczka, himself a PAA Honorary Life Membership recipient in 1970, presented the award.